It was 32 teams who started the season in the best club competition in the World, with 16 to progress into the knock-out stage, in their bid to finally get the trophy from Real Madrid. 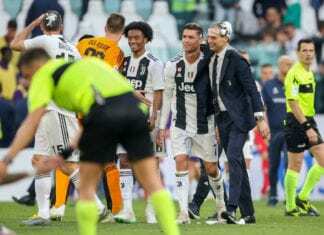 Los Blancos won the Champions League for three times in a row but started their first season in nine years without club’s best goal scorer – Cristiano Ronaldo who moved to Juventus. However, the European Champions didn’t have any problem reaching the knock-out stage, despite being two times outplayed by CSKA Moscow. The Russians didn’t go through, as AS Roma finished on the second place in the Group G. Mariano Diaz scored a beauty against the Italians in the opening Matchday, which was his first goal in the competition. Barcelona was the first team to secure Champions League spring having accumulated 10 points with three wins and one draw in their first four games. The Catalans scored some great goal in the group stage, as you can see in the video. Dembele’s solo run vs Tottenham on Cam Nou was certainly one of top five goals in the groups, with Rakitic’s amazing volley on Wembley also being up there. Cristiano Ronaldo scored the best goal in the Champions League so far, after converting a Bonucci’s great cross into a perfect finish against his former club Manchester United. Ronaldo got euphoric and could not resist celebrating the goal. Juventus lost that game 2-1 to United but won the Group H on top of the Red Devils. Arjen Robben also made the list with a classic left-foot stunner, which was a reflection of his trade-mark finishes when the Dutchman was at the top of his game. Bayern finished first in their group and made their way in the knockout stage together with Ajax. It was the most interesting in Group C, as PSG and Liverpool advanced over Napoli. The Anfield Road side won the last game of the group stage against Napoli 1-0, which was just enough to see them pas the Italians on goal difference. Neymar’s free kick in the 6-1 trashing of Red Star Belgrade is as well on the list of top goal from the Champions League group stage. The knock-out stage starts tomorrow, as UEFA is set to introduce the VAR into the competition. The first big game of the Round of 16 is played on Old Trafford between Manchester United and PSG. Liverpool meets Bayern, while Juventus travel to Atletico Madrid in another classic Champions League clashes.